German investor sentiment in September fell again, the ninth successive month of decline, according to ZEW (Zentrum für Europäische Wirtschaftsforschung – Center for European Economic Research) in Mannheim, Germany, a non-profit independent institute. A total of 222 analysts and institutional investors took part in the survey. The participants were asked about their expectations for the German economy for the next six months. Following September’s 1.7 point fall, the ZEW Indicator of Economic Sentiment for Germany is currently at 6.9 points, compared to a long-term average of 24.6. A Wall Street Journal poll of economists had expected the ZEW Index to fall to 5 points. 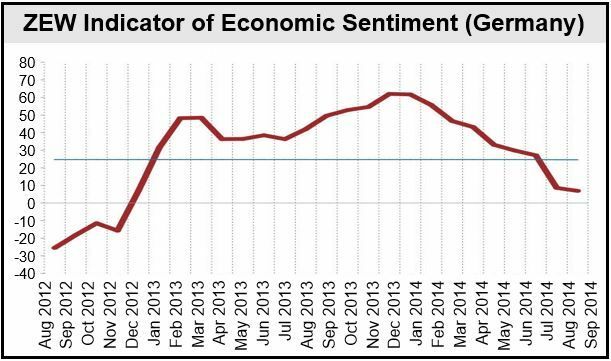 German economic sentiment is now at its lowest point since December 2012. On a positive note, however, ZEW points out that September’s decline was much lighter than August’s. ZEW’s assessment of Germany’s current economic situation has declined by 18.9 points and now stands at 25.4. The ZEW Indicator of Economic Sentiment for the Eurozone fell 9.5 points in September to 14.2, while the indicator for the Eurozone’s current economic situation fell 10 points to (minus) -42.8. The survey results raise questions about the fragility of Germany’s economic recovery. German GDP shrank in the second quarter of 2014. In a short briefing, a ZEW economist said sentiment improved slightly after the ECB (European Central Bank) announced cuts in interest rates and the planned purchases of assets.